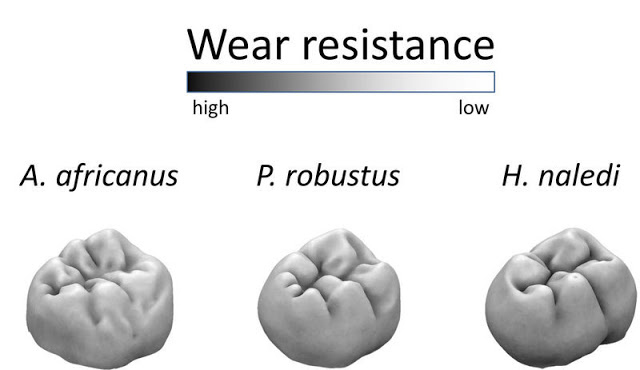 Homo naledi’s relatively taller and more wear resistant molars enabled it to have a much more abrasive diet than other South African hominins. This is the result of a recent study published in the Journal of Human Evolution by researchers from the Max Planck Institute for Evolutionary Anthropology in Leipzig, the University of Durham in the United Kingdom and the University of Arkansas in the United States. The researchers conclude that Homo naledi may have eaten a much grittier diet than other South African hominins. Mammals that eat foods that need to be cut, like leaves and grasses, have sharper, more complex molars (i.e. more cusps and crests), while mammals that eat foods that need to be crushed, like fruits and nuts, have duller, less complex molars. The researchers used a technique known as dental topography to measure molar sharpness, complexity, and other aspects of tooth shape in South African hominins to reconstruct the diet of Homo naledi.